17-AAG is an ansamycin antibiotic which acts as an anti-tumor agent. Specifically, 17-AAG binds and inhibits Hsp90. VER-50589 is an isoxazole compound that inhibits Hsp90 with an IC50 value of 21 nM. VER 155008 is a small molecule, ATP-derivative inhibitor of HSP70 (IC50 = 500 nM). Geranylgeranylacetone can induce expression of HSP70, HSPB8, and HSPB1. VER-49009 is a pyrazole compound that inhibits Hsp90 with an IC50 value of 47 nM. NMS-E973 is a potent and selective Hsp90 inhibitor. Alvespimycin is a selective Hsp90 inhibitor with a GI50 of 53 nM. PU-WS13 is a potent, Grp94-specific Hsp90 inhibitor of the purine scaffold class. PU-WS13 is a cell-permeable inhibitor of Grp94 with EC50 of 220 nM. Macbecin I is an ansamycin antibiotic compound that inhibits Hsp90 activity with IC50 value of μM by binding to the ATP-binding site. Rocaglamide is the first cyclopenta[b]benzofuran derivative (flavagline), isolated from Aglaia elliptifolia in 1982 by King and colleagues based on its antileukemic activity. KNK437, dose-dependently inhibited the acquisition of thermotolerance and the induction of various HSPs including HSP105, HSP70, and HSP40 in COLO 320DM (human colon carcinoma) cells. Gedunin, a naturally occurring Hsp90 inhibitor, is tetranortriterpenoid isolated from the Indian neem tree (Azadirachta indica). TRC 051384, belonging to substituted 2-propen-1-one class, is a potent inducer of heat shock protein 70 (HSP70) . Induction of HSP70 is a natural response of stressed cells that protects neuronal cells from a variety of insults including acute ischemia. EC 144 is a potent inhibitor of the heat shock protein 90 and was found to be effective in tumor growth suppression. HSP990 is an orally bioavailable inhibitor of human heat-shock protein 90 (Hsp90) with potential antineoplastic activity. IPI-493 is a potent and orally bioavailable HSP90 inhibitor with Ki of 21 nM. Debio 0932 is a novel heat shock protein 90 (HSP90) inhibitor with strong affinity for HSP90 alpha/beta, high oral bioavailability and potent anti-proliferative activity against a broad range of cancer cell lines (with a mean IC50 of 220 nmol/L), including many non-small cell lung cancer (NSCLC) cell lines which are resistant to standard-of-care (SOC) agents. AUY922 (NVP-AUY922) is highly potent and oral inhibitor of Hsp90 with IC50=21 nM in Hsp90 FP binding assay and inhibits proliferation of various human cancer cell lines in vitro, with GI50 average 9 nM. NVP-BEP800 is a novel, fully synthetic, orally bioavailable inhibitor that binds to the NH2-terminal ATP-binding pocket of Hsp90. BIIB021 is an oral fully synthetic Hsp90 inhibitor that selectively and potently inhibits the molecular chaperone Hsp90 thereby inhibiting the proper assembly of multiple oncogenic proteins involved in tumor growth and survival. AT13387 is a targeted inhibitor of Hsp90,inhibiting its chaperone function and promoting the degradation of oncogenic signaling proteins involved in tumor cell proliferation and survival. Geldanamycin binds to the ATP site of Hsp90 (Kd = 1.2 μM) and inhibits its chaperone activity. PF-04929113 (SNX-5422) is orally bioavailable heat shock protein 90 (Hsp90) inhibitor. 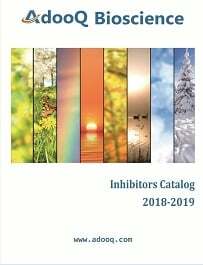 Ganetespib is a potent, synthetic, small molecule inhibitor of Hsp90, a chaperone protein that is essential to the function of certain other proteins that drive the growth, proliferation, and survival of many different types of cancer. 17-DMAG is a water-soluble analog of 17-AAG and geldanamycin that binds the ATP binding site of Hsp90 and inhibits its chaperone activity. Displays more potent antitumor activity than 17-AAG. KW-2478 is an agent that targets the human heat-shock protein 90 (Hsp90) with potential antineoplastic activity. MPC-3100 is an orally bioavailable, synthetic, second-generation small-molecule inhibitor of heat shock protein 90 (Hsp90) with potential antineoplastic activity. Elesclomol induces oxidative stress by provoking a buildup of reactive oxygen species within cancer cells. IPI-504 is a novel, water-soluble, potent inhibitor of heat-shock protein 90 (Hsp90). XL888 is an orally bioavailable, ATP-competitive, small-molecule inhibitor of heat shock protein 90 (Hsp90) with potential antineoplastic activity. KRIBB11 is an inhibitor of Heat shock factor (HSF) inhibitor, with IC50 of 1.2 μM.